The Boss TU-10 Clip-On Tuner is the first clip on tuner to bear the Boss name, and it marks a major step forward for this type of tuner. With an accuracy of +/- 1 cent, the TU10 is certainly very precise, but it is the other complimentary features that make this tuner so impressive. The "true" colour LCD screen on the Boss TU-10 is highly visible, so you can easily see the precise display on stage - an essential quality for live use. Accu-Pitch quickly indicates when you have successfully tuned a string. Stream mode works in a similar way to strobe tuners, where a wave runs continually across the display, and slows down as you get closer to the desired pitch. There is support for flat tunings as far as 5 semitones down (low B). There is even a battery saving monochrome display mode, for times when added visibility is not such a major issue. 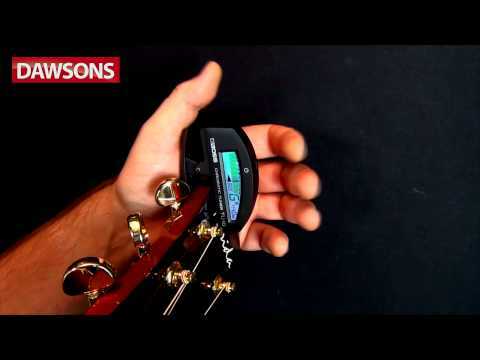 Incredibly simple to use, you simply clip this handy tuner on to the headstock of your guitar, position it so that the screen faces towards you and switch it on. Because it clips on, you can tune without any need for a cable, flat surface or hand to hold the tuner - you can focus on playing in perfect tune, even in crowded unplugged acoustic sessions. You can quickly switch mode if needed, although the Boss TU10 will stay in the same tuning mode even when switched off and on again, so you can leave it set to your preferred mode. For such a small piece of kit, this is incredibly powerful and it should certainly be in your guitar case/gig bag for quick access.